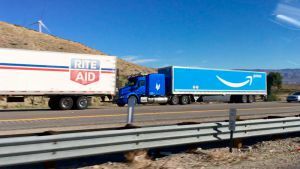 On Jan. 25, a Reddit user posted a photo of a self-driving truck pulling a trailer emblazoned with Amazon’s Prime logo. Almost a week later, CNBC reported that Amazon is, in fact, using tractors created by self-driving truck developer Embark to haul cargo — and the truck spotted last week could be the first of many. The CNBC article claims the publication “has learned” about Amazon’s use of the Embark technology, but it wasn’t clear whether its knowledge was based strictly on the Reddit photo or some additional insights. Neither Embark nor Amazon would comment to CNBC about a deal between them, but they didn’t deny it either. And in any case, the Embark logo is featured prominently on the tractor, and it’s impossible to miss the giant Amazon logo on the trailer. So, while we don’t know if this is the only Embark tractor hauling Amazon cargo or if more are already on the road, that second part of Amazon’s comment seems to imply autonomous shipping is poised to play a major role in the company’s future.